Over the years, the NBA draft has morphed into something like the Academy Awards. Basketball's brightest young stars take the stage for their big moment, and, naturally, they want to look their best. Contemporary NBA draft fashion is about making a statement. Players want to stand out, in a good way. They want to be remembered, but not for being tacky. Some even want to add a personal touch. The perfect draft outfit is all about calculated risk—finding that delicate balance between bold and classic (think Dwyane Wade at the Met Gala). High marks will go to those who simultaneously achieved originality and class. Lower marks will go to anyone who either pushed the envelope too far or not far enough. Like the Oscars, accessories count too. Think of this as a weighted grading system: shoes and jewelry count, but the suit is the heavy hitter. Who was memorable without being laughable? Who nailed the effortlessly cool look, and who should probably stick to basketball shorts? Style is all a matter of opinion, and the following are mine. Warning: Prepare for a lot of photos of Adam Silver. This is the type of suit people will either love or hate. After all, when it's likely you'll go No. 1, there is even more pressure to make a statement. Kentucky's Karl-Anthony Towns succeeded where Andrew Wiggins failed last year, however. Towns toed that line between original and tacky, and he came out on the right side of it. It definitely looked like a Magic Eye poster, and that's not necessarily a bad thing. Plus, the decision to forego a tie was a good one—let that jacket shine. Suit game is on point so far. Depending on where a player went to college, sporting the alma mater colors can be risky business. Ohio State's D'Angelo Russell pulled it off rather well, though. His red jacket/white pant suit combo was bold, adventurous and, best of all, personal. A man who can pull off bright colors will do well in a city like Los Angeles. The one critique here is that the outfit was just a bit busy. One less showy feature—perhaps losing the pocket square or slippers, for example—and this would've been an A+. Jahlil Okafor's suit looked like a well-tailored nod to a Hugh Hefner robe, and you know what? It sort of worked. The stars added a nice speck of (Philadelphia 76ers?) flair, but the bow tie wasn't my favorite. All in all, not bad. To be fair, given how Towns and Russell came out of the gate, the bar was pretty high. New York Knicks fans did not like this pick, but maybe the booing was more about Kristaps Porzingis' suit? It's unfortunate he had to go right after Okafor, who wore a version of the same duds, only better. For one thing, Okafor's choice to go with black pants worked much better than Porzingis' all-burgundy ensemble. I appreciate going for something bold with the leather lapels, but unfortunately, it's just a little movie-theater-usher-esque. I also appreciate it's difficult to find a perfectly fitting suit when you're almost 7 feet tall, but the jacket looked a smidge big. Willie Cauley-Stein had me until the peace-sign chain. The Kentucky-colored, polka-dot bow tie provided a needed splash of color on an otherwise pretty basic (yet very sharp) suit, but a gaudy chain like that? That is a throwback to another, much less fashionable time, my friend. Accessories brought this one down. 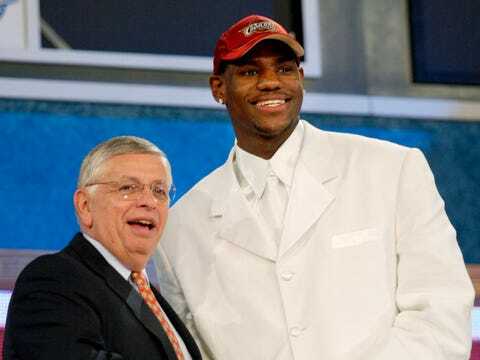 Emmanuel Mudiay said LeBron James' all-white suit in 2003 made him realize that, at the NBA draft, suit game matters. And you know what? He did OK. His suit fit well, and despite its basic color, the inside of the suit jacket was pretty special. Stitched inside were flags of his native Democratic Republic of the Congo as well as China, where he's been playing his pro ball. A black shirt collar was a nice touch, but that colorful pocket square was a little too obvious. It felt like a last-minute "Oh shoot, there's no color on my suit" fix. Stanley Johnson's outfit choice was sharp but a little casual. It looked more like something you'd wear to a fancy brunch than the NBA draft. That said, his clothes fit well, and his tie was boss. Loved the tie. Frank Kaminsky's suit may or may not have been from J.C. Penney, and you know what? The Wooden Award winner looked good. The light gray was sharp, and the 7-footer managed to make sure his suit fit pretty well. I would've liked to see a different tie/pocket square color choice, however. Top to bottom, it was a little bland. Plus, he pretty much wore the same thing as Adam Silver, which is never ideal, since Silver was probably just trying to blend in. The tank patches inside the jacket were awesome though, single-handedly bumping him up from a B- to a solid B.
Duke's Justise Winslow looked sharp. The rich blue color of his suit was gorgeous. He nailed a classic look, and he did it so well I can forgive a lack of risks here. With that fashion sense, Winslow is going to fit right in with Dwyane Wade (probably) in Miami. There was a little nod to LeBron James—just a little one—in this draft. Unlike King James in 2003, however, Myles Turner added some color to his white jacket. Pink is always a bold choice, and it looked good in places, but there was maybe just a little too much of it—pants, bow tie, shirt and pocket square—all in different shades. The whole thing might've worked a little better with a light gray suit. Points for effort, though. Trey Lyles' suit was definitely not bad, but the accent color was a little bleh. Then again, it sort of gave me a Peewee Herman vibe, which was awesome. The gray suit was sharp, but I just would like to have seen it brightened up with a little more pizazz in the accents. Overall, it was about average. The boys in blue were on point this year. Kentucky's Devin Booker looked super sharp in that bright, but not too bright, blue suit. At first, the tie looked like a couch from the basement of That '70s Show, but upon further consideration, it definitely had a cool hipster vibe. Booker just looked crisp. Nicely done. The only reason this one isn't an A+ was that chain. Cameron Payne's draft suit was an achievement in originality that's not offensive. The whole thing had a nautical feel without being too overt about it: a double-breasted indigo jacket, white pants and gold buttons. Russell Westbrook is probably going to dig this guy in Oklahoma City. For real, though, what is with the slippers? I've never been a big fan of shiny suits. Lionel Messi just ruined it for everyone. Plus, the pattern mixing with Kelly Oubre's shirt and tie was a bit much. But let's be honest, it didn't really matter what the suit looked like, because those shoes. What was the thought behind those bad boys? Was Oubre trying to have a Wizard of Oz, "no place like home" moment? Punish anyone who stepped on his toes? No idea. The suit was not good, but the shoes were memorable. That's what saved this one from falling into D-range. Sam Dekker looked sharp and not too flashy—at first glance, kind of what you'd expect from a Wisconsin guy. Then again, the navy/purple combination was a smart choice. Dekker exceeded expectations here with a dash of unexpected originality. Unrelated: If that's as adventurous as he gets, he might not quite fit in with trendsetter James Harden in Houston. Light gray is a great look, especially this time of year. Jerian Grant's bright red tie and flower were perfect additions to that crisp suit. It was reminiscent of Justise Winslow back at No. 10 in its brilliant simplicity. However, I did say originality counts, so I can't go all the way to the top with his grade. Bobby Portis went to Arkansas, so I dug the Razorback pride displayed in his suit choice. The maroon was a little played-out by this time in the draft, but the gray tie was an excellent choice and the pocket square was killer. While the color wasn't great, this was the best burgundy/maroon look of the night. I don't give out failing grades lightly, but Rondae Hollis-Jefferson's pants just screamed for an F.
Not to state the obvious, but they were pajamas—Christmas-morning pajamas. Plus, black doesn't always go with everything. The tuxedo-esque top of this ensemble just seemed completely detached from the bottom. Yes, he took a chance, but it just didn't pan out. Chris McCullough wasn't invited to the green room, but hey, he was in the building. His jacket and tie had a great vintage look, but the white pants were a mistake. Instead of coming across as hip and modern, the whole look failed to make it into the 21st century. Well, he was the last pick of the first round, but going to a champion was probably worth the wait for Kevon Looney. There was nothing special about his suit, but it fit well and he looked good (especially with the look of relief on his face).